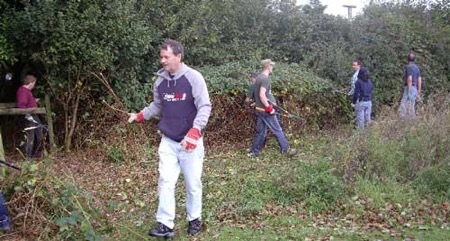 We were grateful to have the assistance of a group of volunteers from the Aviva Solutions Delivery team recently, who spent what they graciously called :-) 'an enjoyable day' painting aviaries and clearing overgrown bramble hedges at the centre. Painting the outside of some of the creche aviaries no doubt made a change from the daily desk routine - but there were no complaints! Aviva is the major insurance company based in the region (formerly known as Norwich Union) and as part of its’ commitment to the community allows staff time away from their normal jobs to contribute to their community. The team started with breakfast at the Stonham Barns complex, setting themselves up for the hard work ahead. Aviary painting followed, then a spot of lunch and then a really enjoyable tour and presentation on the work that SOS carries out. Further into the afternoon saw the crew back at work and clearing some overgrown Bramble hedges before finally retiring for tea and scones - as they commented, 'all very English'. The team went on to say how enjoyable the day had been and how having thirteen pairs of hands certainly made quick progress on the jobs that head falconer Matt Lott had set them. Spokesman Ed Godbold of Aviva said: "The team mostly work on assignments day-to-day which may not see them actually working together on projects, but today allowed our team to grow and let people get to know each other better in a fabulous environment, helping to keep a much need facility running." The team certainly made a sterling contribution to our winter work schedule and we appreciate their help very much - thanks guys!